All photos by Renée DeVoe Mertz, May 23, 2015. 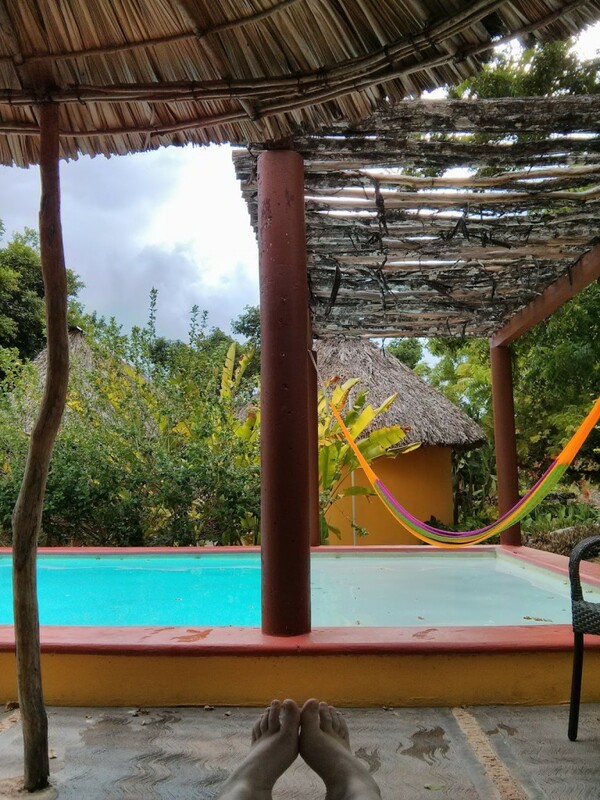 After leaving X’batún and Dzom-Bacal cenotes, Josh and I headed to the Pickled Onion, an eco-hotel that would serve as our base and surrogate home for the next two nights as we explored the Ruta Puuc. 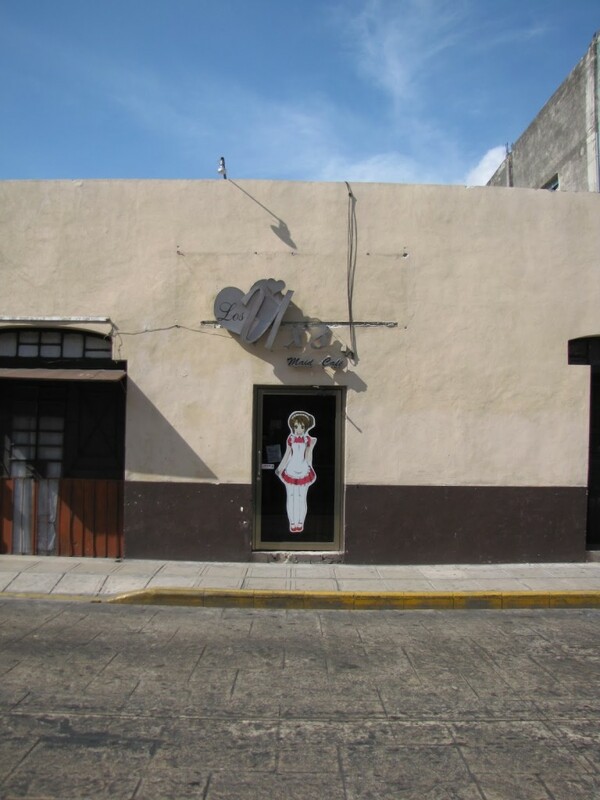 Located between Uxmal (15 km) and Kabah (8 km) on the outskirts of the small town of Santa Elena, the Pickled Onion is run by Canadian ex-patriot, Valerie Pickles. Valerie’s passion for the Yucatan and her pride in cooking with fresh ingredients and purified water made the B&B one of the highlights of our trip and, thus, deserving of its own post. I also had the best mojito of my life here, a fact that gives the Pickled Onion a particularly special place in my heart. Guest quarters consist of a series of small cabanas designed for minimal environmental impact and constructed in the style of contemporary Maya homes, with wood-and-concrete walls and thatched roofs. 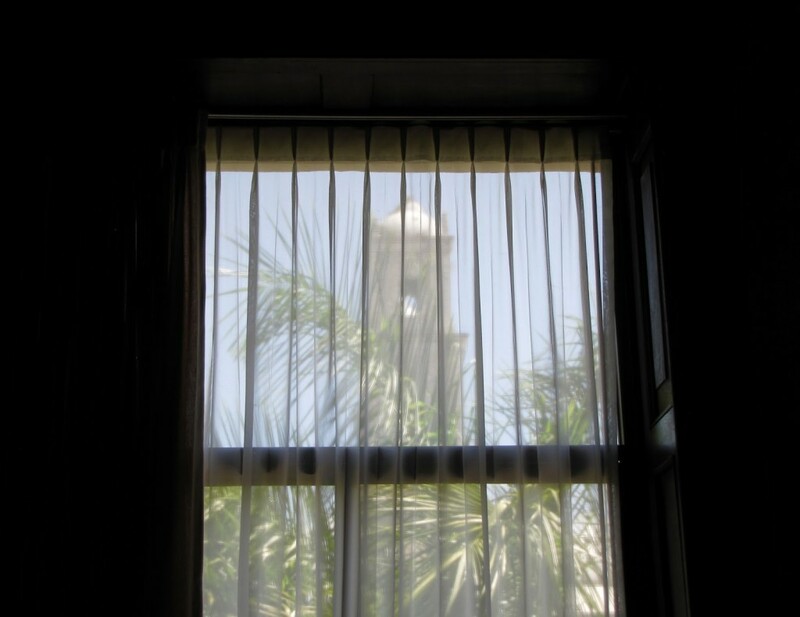 For those unaccustomed to eco-hotels (as we were), the structures may at first feel disconcertingly permeable, with insects and geckos passing easily through windows, within the woven ceiling, and beneath the roofline. Of these visitors, we most appreciated the geckos. Not only were they cute, but they served as natural bug-reducers. Their tiny feces, which dropped down from the ceiling onto furniture and suitcases, were less welcome but easy to clean up. 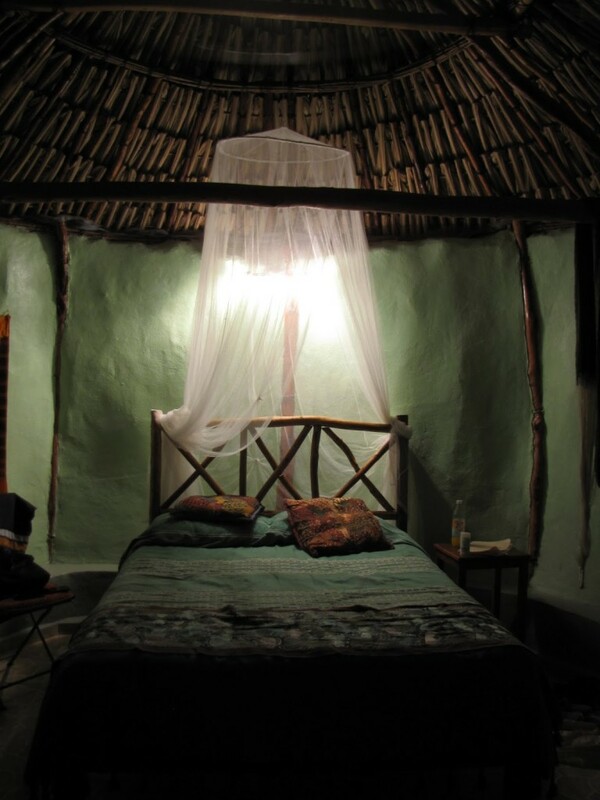 Our room contained both a western-style bed (with netting) and a hammock, the latter of which is the preferred bedding for many locals and the cooler option on warm nights. Unfortunately for us, we were not particularly adept at sleeping in hammocks, and our first night was tortuously uncomfortable due to the inescapable heat. 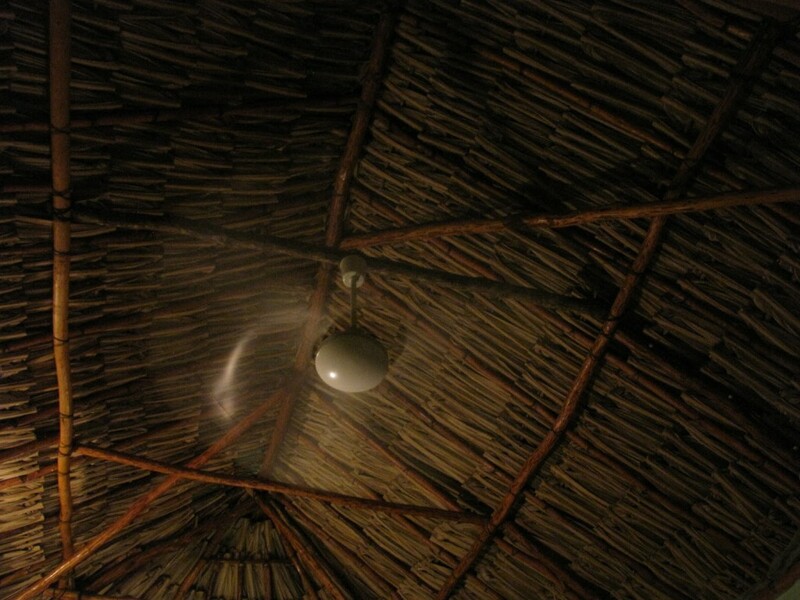 In addition, we had to choose between using the mosquito netting over the bed—which helped to deter the small, black, biting insects that made their way into our sheets at night—or the overhead fan, because the manufactured breeze could not penetrate the lightweight canopy. Eventually, though, we accepted our bug-bitten fate, chose the fan, and finally fell asleep. The temperature the next day—like most days—was in the 90s, and we ended up relaxing in the well-kept pool after an intense several hours of exploring ruins. Thankfully, the evening finally cooled off and our room became perfectly comfortable. We slept hard that night, and only reluctantly rolled out of bed (late) the next morning. The only other unpleasant aspect of our time at the Pickled Onion, aside from our hot and buggy first night, was the appearance of moldy fruit in our breakfasts both mornings. 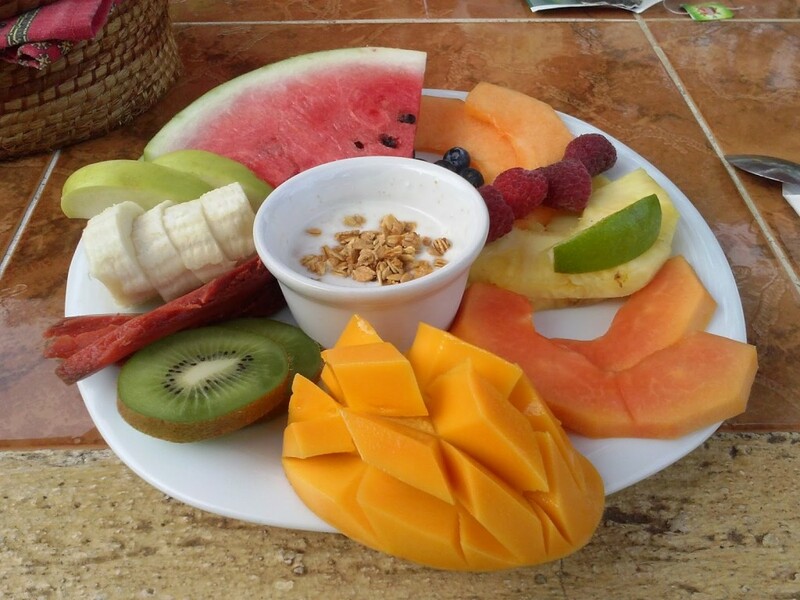 This may sound nitpicky—and probably is, given that the rest of our food, even the rest of the fruit, was either good or excellent. At the time, though, we were already on our guard about all things food related, and had specifically been warned about eating the skins of uncooked fruits and vegetables. While never enticing, the repeated discovery of mold was especially off-putting in this context of food-paranoia, and made us nervous about everything else we consumed there. Fortunately, it turned out that such worries were needless, as we never got sick from anything we ate or drank at the B&B. Now back to the good stuff. In addition to the hammock, our room contained a number of thoughtful details, including decorations of locally made crafts and a fridge (which, even when turned off, was useful for storing food without attracting bugs). 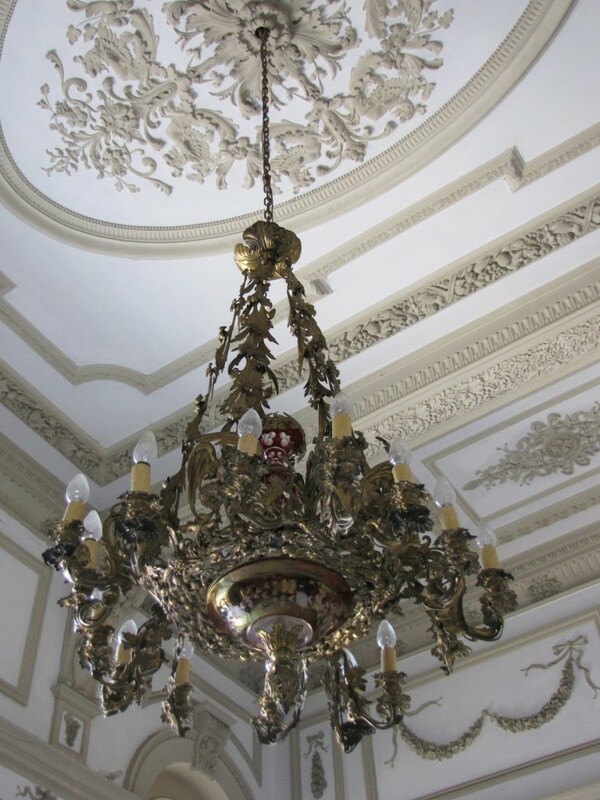 My favorite touch, however, was the binder Valerie put together with descriptions of nearby sites, important information about the rooms (toilet paper goes in the trash; tipping is encouraged; to-go lunches need to be ordered the night before; etc. 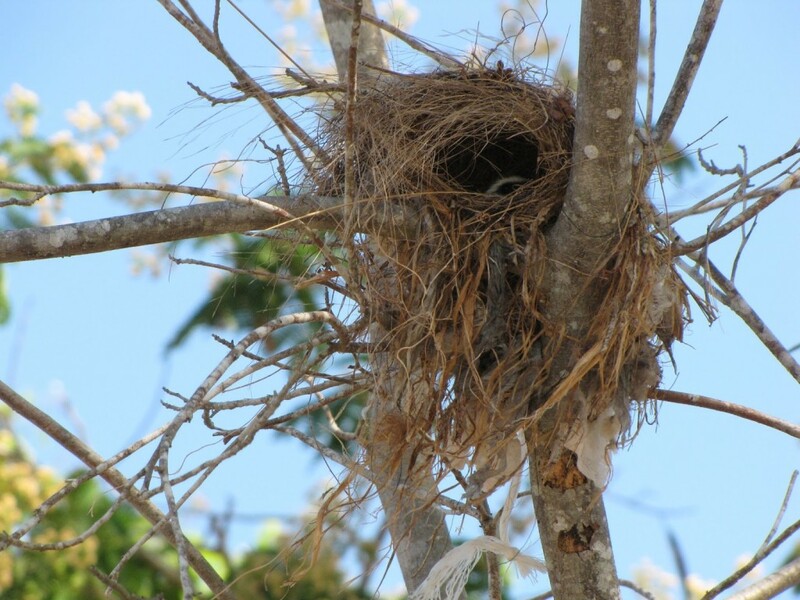 ), and a short autobiography explaining how she came to own a bed and breakfast in Santa Elena. All things considered, we would definitely stay at the Pickled Onion again, although preferably in the cooler months. The restaurant is open to non-guests in the evenings, so if you are in the area, even if you stay at another hotel, I strongly suggest getting your dinner (and a mojito) here. All photos by Renée DeVoe Mertz, May 2015. X’batún cenote. Photo by Renée DeVoe Mertz/Joshua Albers, May 22, 2015. 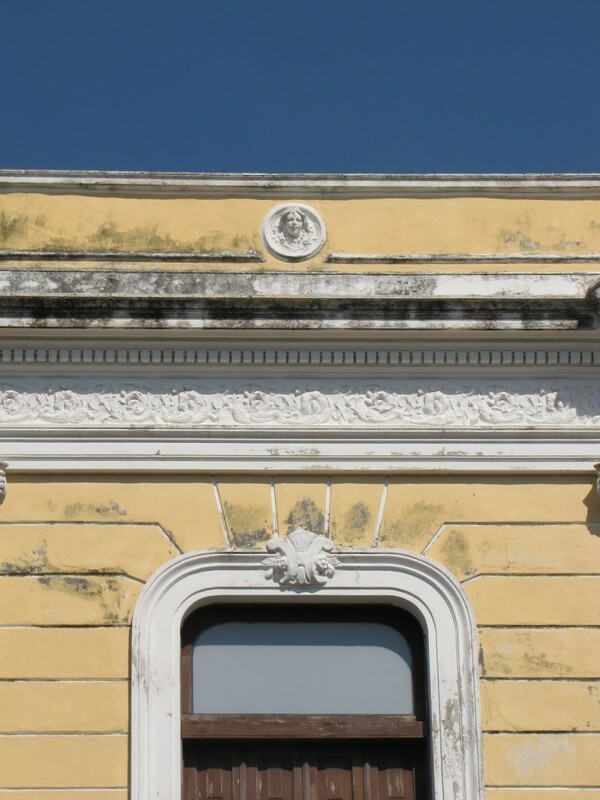 We said goodbye to Mérida on the morning of our fourth day and headed towards the heart of the ancient Puuc region, where we would spend the next two nights. Before diving into our next archaeological adventure, however, we took a slight detour to the X’batún and Dzom-Bacal cenotes. These swimming holes, located about halfway between Mérida and Uxmal off Highway 261, are popular spots for locals, and we shared our time there with families and elderly couples alike. Bees and their honeycomb at X’batún. Photo by Renée DeVoe Mertz, May 22, 2015. Despite a general lack of signage, we eventually found our way to the check-in point in San Antonio Mulix, where we paid and used the small bathrooms to change. Unfortunately, it was also here that our poor knowledge of Spanish finally bit us in the bum. I had read in another traveler’s blog that we would have the option of leaving our car there and renting a bike to take the rest of the way. We thought this meant cars weren’t permitted past the check-in point, making walking or biking our only options. Since I don’t ride, we chose to walk, despite the fact that it was dangerously hot and the cenotes were well over a mile away. [Note: Google Maps claims it is only a 0.1 mile, two minute walk to X’batún; that is WRONG.] As we started out, every person we passed looked at us like we were crazy—which we probably were—but we just smiled in return and kept plodding towards our destinations. Eventually, a concerned man came down from one of the few structures along the way to ask why we were going by foot. After a little back and forth, we finally understood that cars are permitted by the cenotes, leading us to very gratefully turn around and get ours. Wasps’ nests clinging to the limestone outcroppings at X’batún cenote. Photo by Renée DeVoe Mertz, May 22, 2015. X’batún is the better known of the two cenotes, perhaps because it is the easier one to photograph, with bright, blue-green water dotted with lily pads and filled with colorful fish. The swimming area is partially surrounded by cliffs—from which long tree roots and wasp nests picturesquely hang—and partially by an open, limestone landing where visitors can enter the water. This short descent is still a little treacherous, however, due to the slippery vegetation that covers the submerged steps and rocks closest to shore. During our visit, one of the older visitors took what looked and sounded like a nasty fall on these stones (although that did not deter him, after a dazed moment, from staying and playing with his friends). 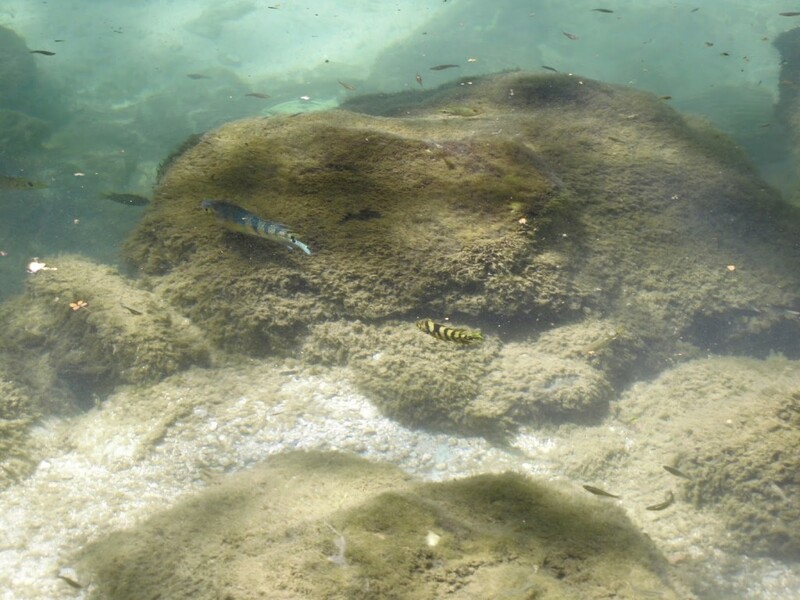 A sampling of the many fish living in X’batún cenote. Photo by Renée DeVoe Mertz, May 22, 2015. 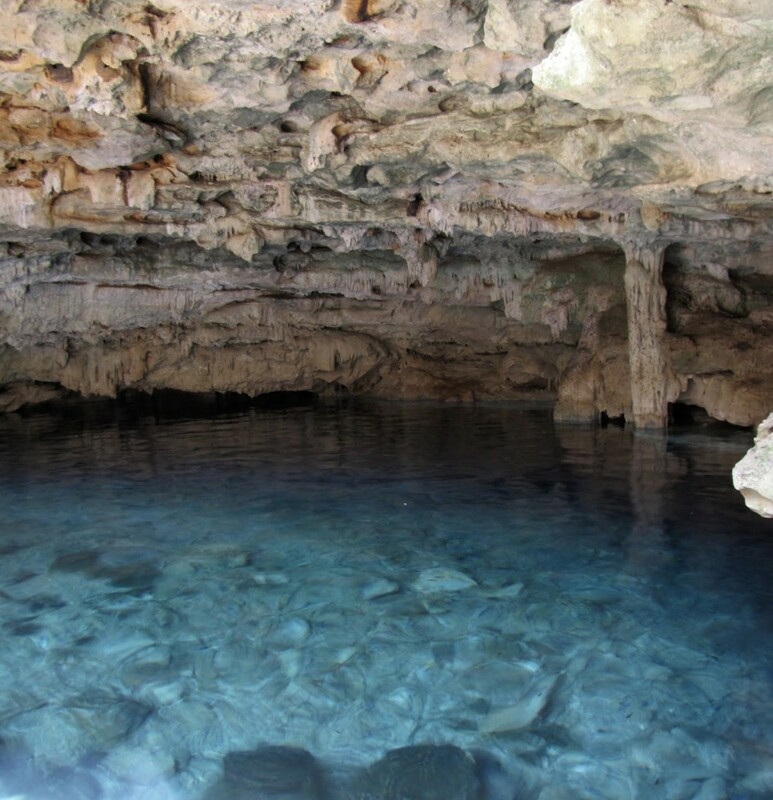 In contrast, the swimming area in Dzom-Bacal is located almost entirely beneath a limestone outcropping and is barely visible to visitors as they walk down the long staircase into the cenote. The cave-like surroundings keep the water particularly cool and blue, with very little flora growing on or between the rocks. 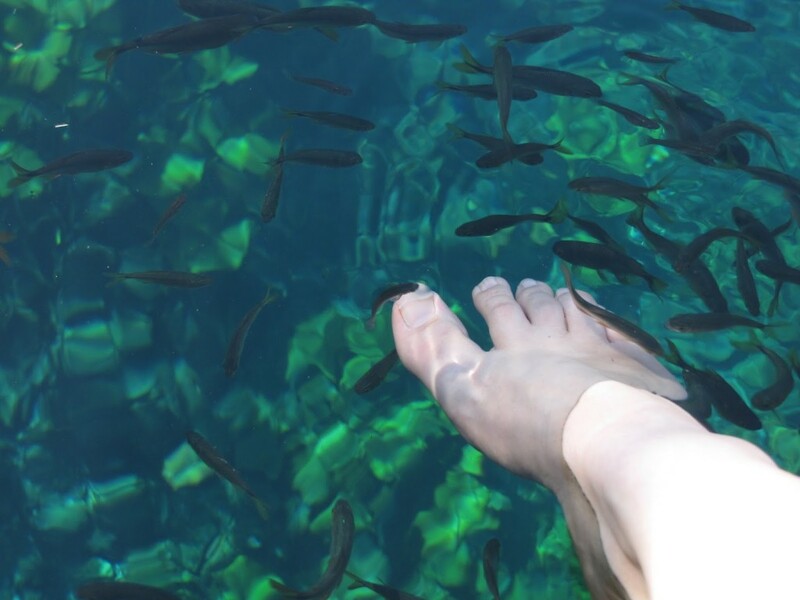 Floating in the giant, liquid sapphire, we watched the few tiny fish swim around us while swallows darted back and forth in the low space above our heads. It was an incredibly beautiful experience, and one of the most serene moments of our trip. Dzom-Bacal cenote. Photo by Renée DeVoe Mertz, May 22, 2015. 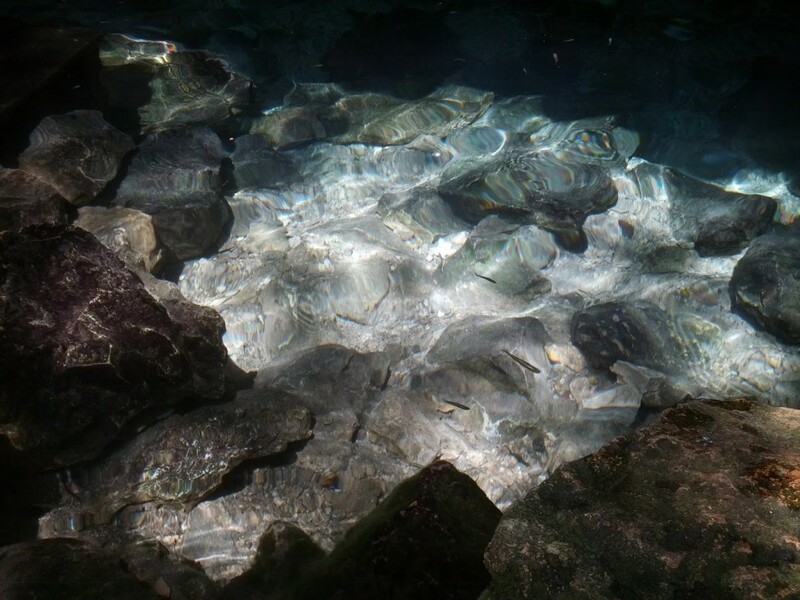 If you go—to these or any other cenotes—remember to not wear sunblock or other lotions, as these will wash off and harm the natural flora and fauna. Large hats and long sleeves are therefore imperative for protecting yourself when out of the water, and the time spent in well-lit swimming holes, like X’batún, should be limited. On the morning of our first full day in Mérida, we hopped back in the car and headed north of the city to Dzibilchaltún. 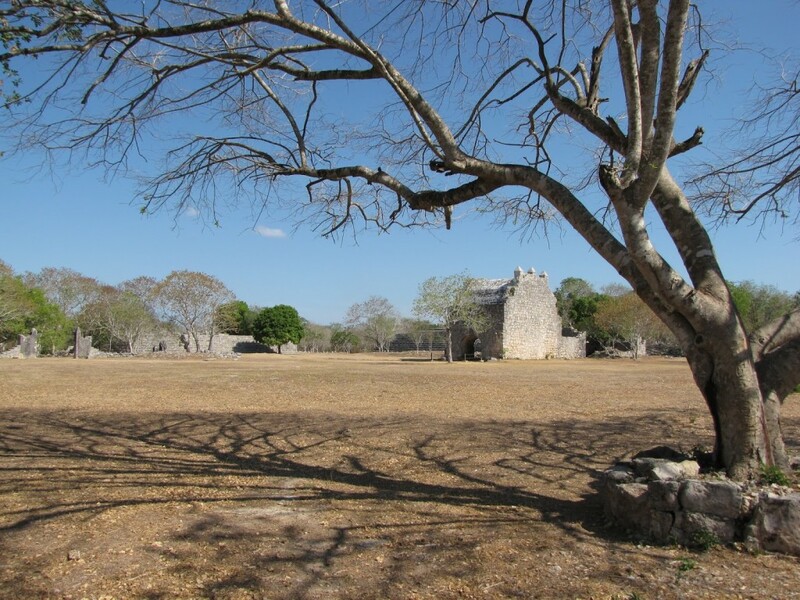 Located on a hot, dry plain about 22 km south of the coast, Dzibilchaltún has the honor of possessing the least picturesque ruins of the 20-plus Maya sites we visited. However, what the destination lacks in architectural or decorative splendor it makes up for in historical importance and, thanks to its cenote, natural beauty. 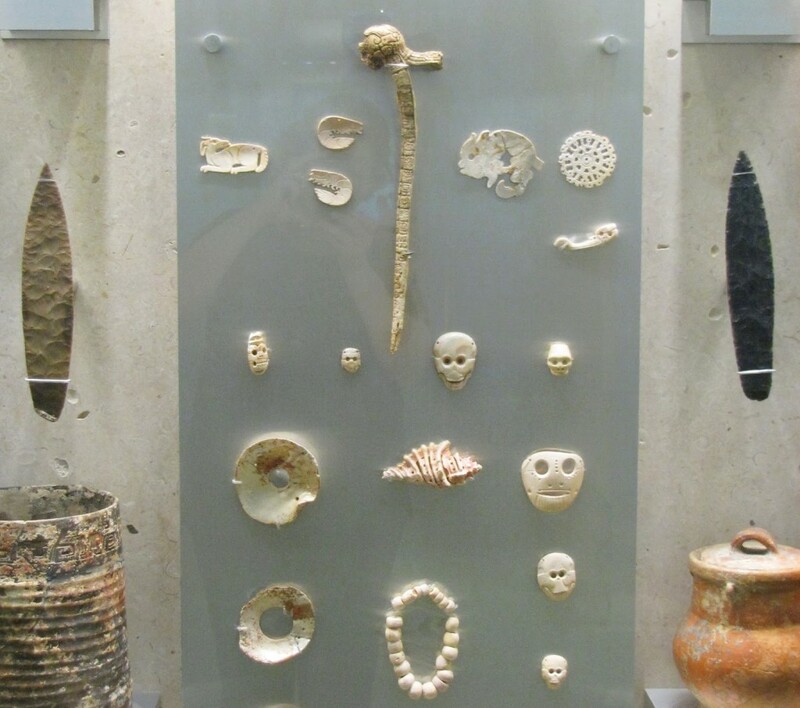 The on-site museum—which consists of both indoor and outdoor displays of artifacts, stelae, and anthropological installations—is also quite good and added significantly to our appreciation of the site. 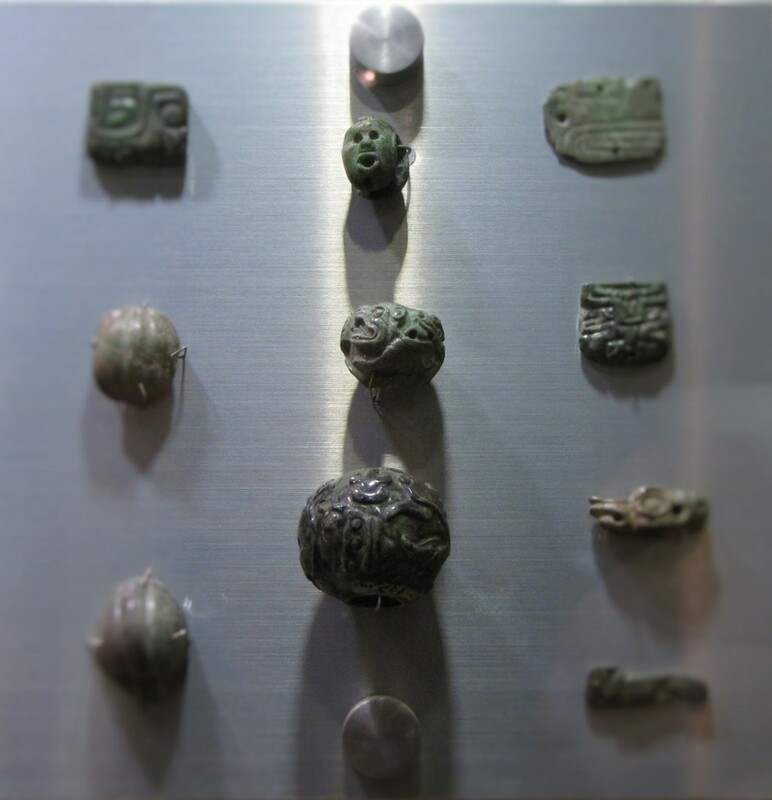 First occupied around 800 BCE, Dzibilchaltún was one of the earliest major settlements on the peninsula. 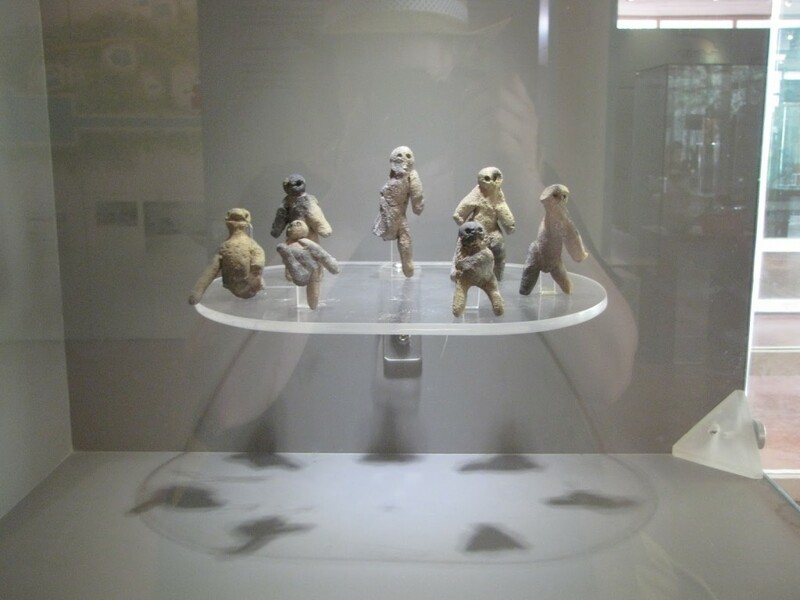 As a result, some of the oldest known ceramics of the region come from here. The local economy was based on salt trade, and the relative strangeness of the city’s location—which is both inhospitable and fairly far from the sea—can be understood as a compromise between finding land that was capable of supporting a minimal amount of agricultural cultivation while simultaneously as close to the salt-producing coastal lagoons as possible. 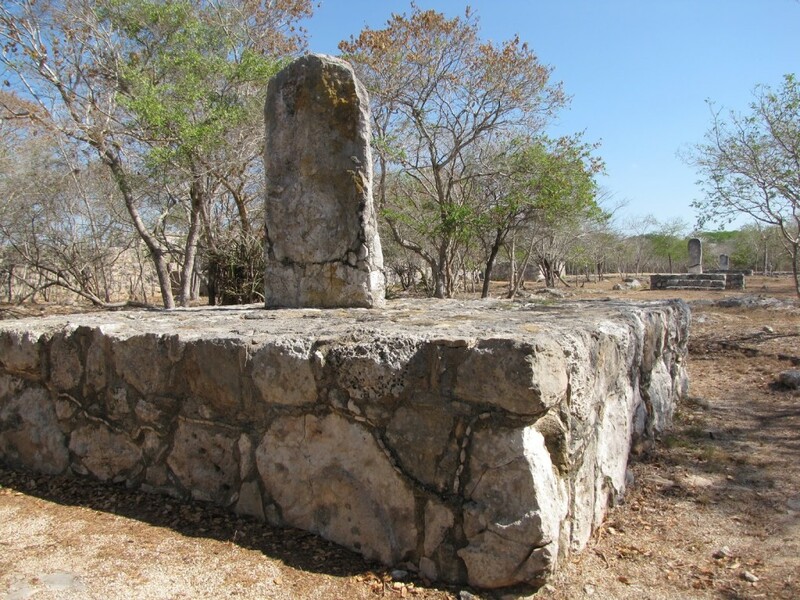 Of course, the presence of a cenote, offering fresh water in an otherwise arid environment, would have been a key factor in the choice of locale as well. At one end of the traversable ruins stands the site’s most iconic building, the Temple of the Dolls. 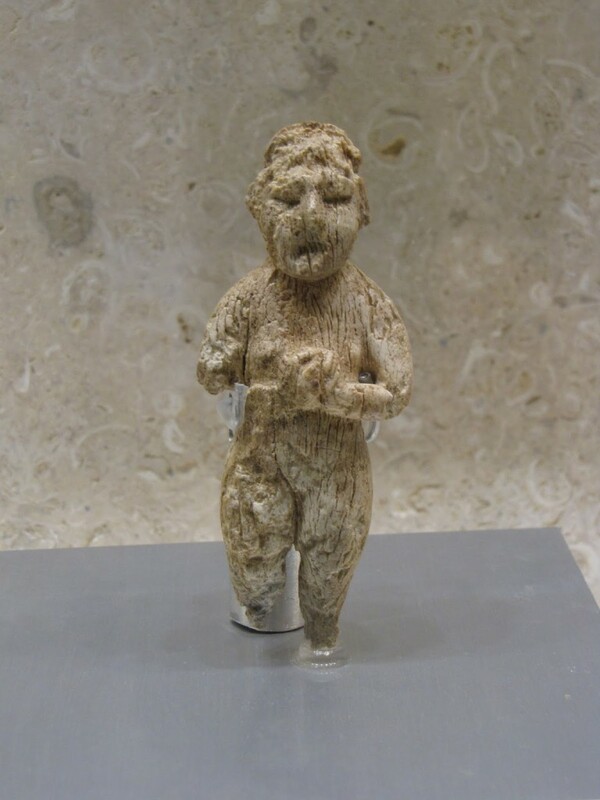 Named for the seven, rough, ceramic figures once buried in front of its altar and now on display in the museum, the temple sits in near isolation at one end of a large, open plaza. 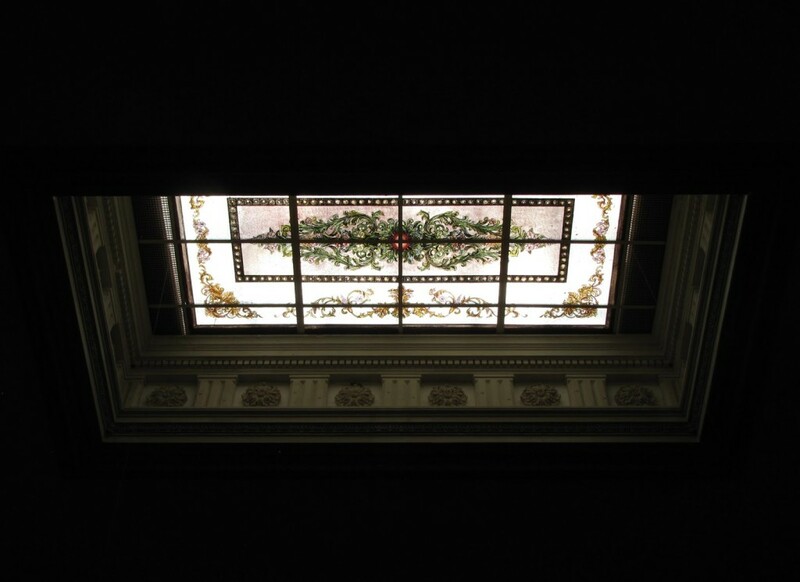 Doors located at the center of each of the sanctuary’s four walls heighten the effect of the square building’s rather unusual radial symmetry, while skeletal remnants of Chaac masks sit above these entrances and at the roofline’s four corners. 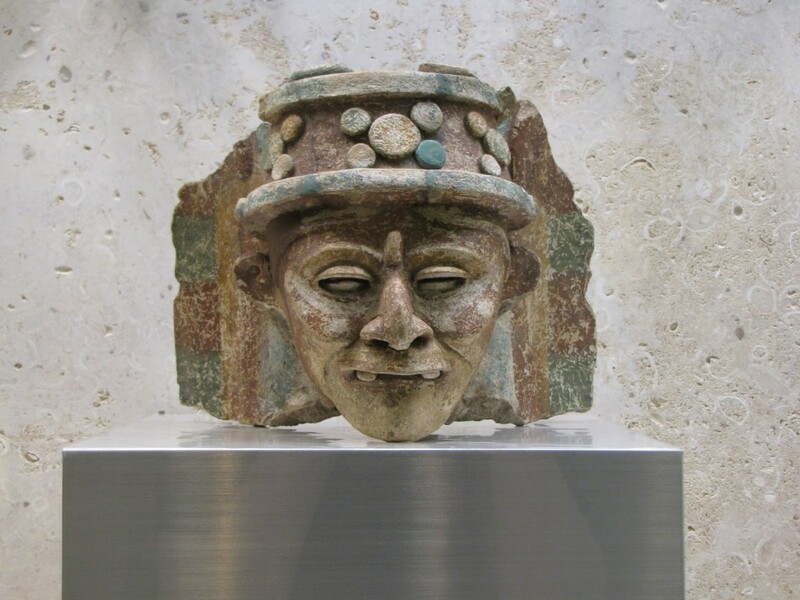 Like many surfaces at the site, the masks (and numerous nearby stelae) were once covered in sculptural, painted stucco. 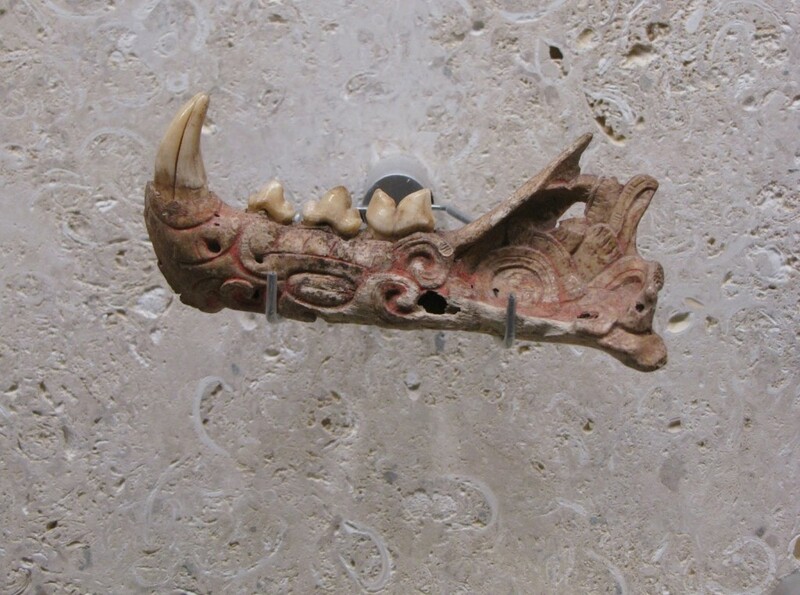 Archaeologists have discovered graffiti inside the temple as well, some of which may date to 1200–1520 CE, when Maya pilgrims reopened and restored the sanctuary. Unfortunately, the building itself is no longer accessible and must be appreciated from a distance. Running east-west, a long, straight sacbe connects the Temple of the Dolls to Dzibilchaltún’s central square. Visitors can either follow this road to the rest of the site or walk along a parallel (and more shaded) path part of the way. Those who take the sacbe will also pass another, circular trail that leads to very little. 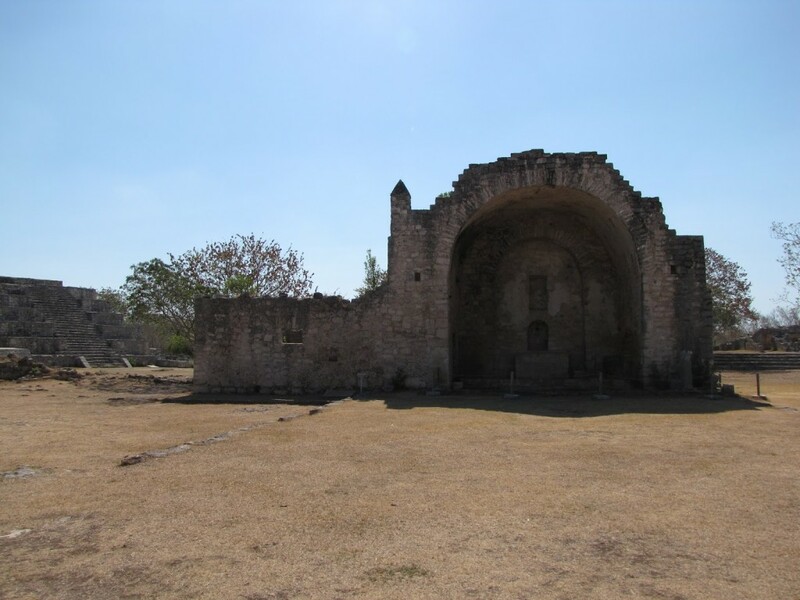 The central plaza consists of a few, spread-out structures, including a small pyramid, an open Franciscan chapel, stone bleachers, and a gateway. On the other side of the gateway lies the Xlacah Cenote, perhaps the site’s greatest highlight. Swimming is allowed, albeit “at your own risk,” but there is no changing room or shower on the grounds. 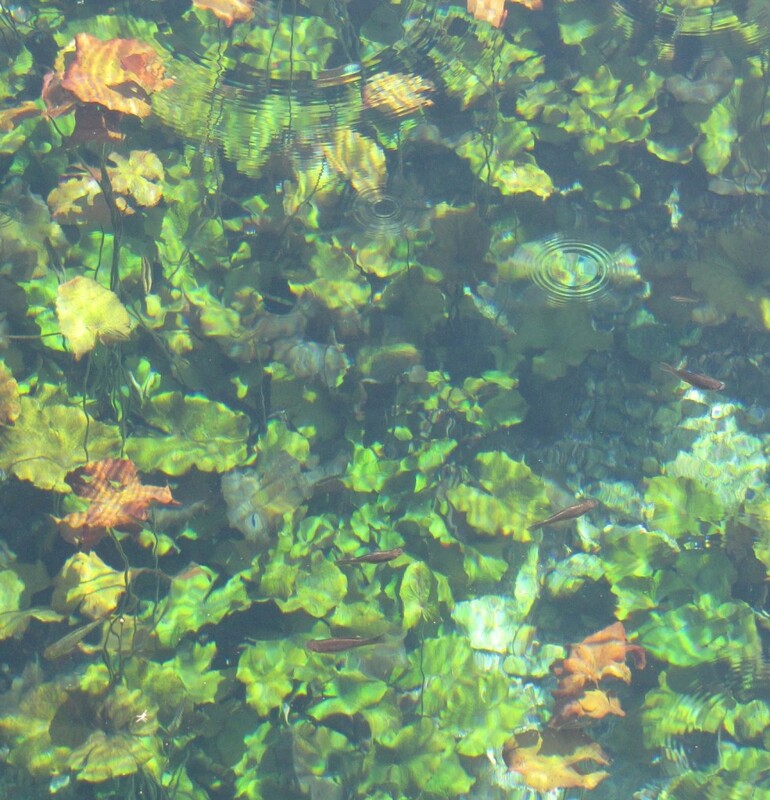 As an oasis in an otherwise parched landscape, the water here is teeming with life. During our visit, the pool seemed especially hospitable to lily pads and various fish, the latter of which struck us as a little too eager to swarm a bit of flesh and check it for possible food. We spent the majority of our time at Dzibilchaltún admiring the cenote and its surrounding flora and fauna, but left the swimming for another day. 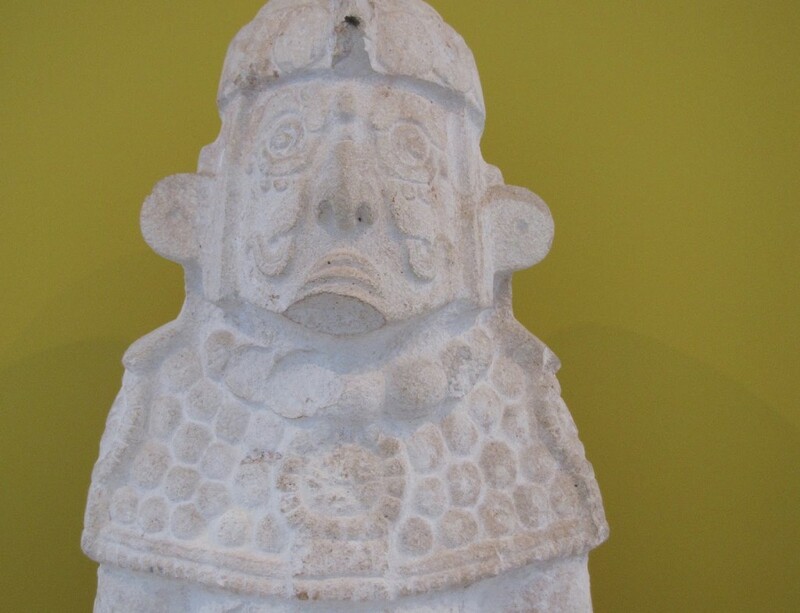 Although I don’t imagine myself returning to Dzibilchaltún, the cenote and museum alone made it worth a visit. If you go, arrive early to beat the tourist groups bused in from Mérida. There is no escaping the sun, so having a hat, sunblock, and plenty of water is especially important here. It was already late afternoon by the time we escaped Balankanché, prompting us to once again skip the cenote on the day’s itinerary and drive straight to our next hotel. 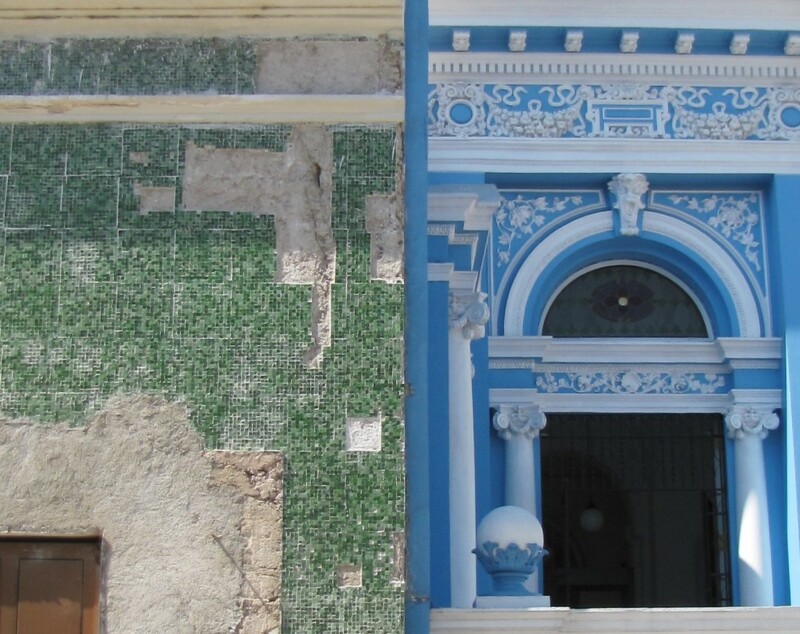 This time we were headed to Mérida, the capital and largest city of the state of Yucatán. 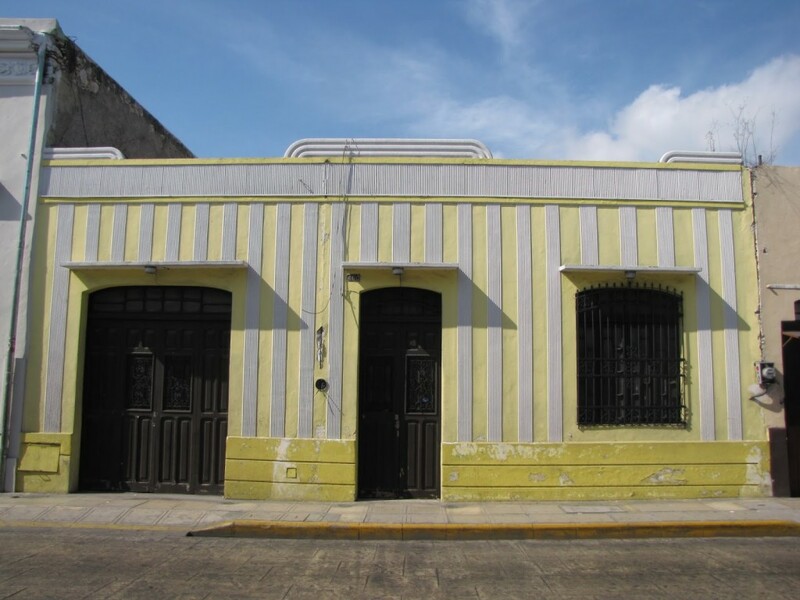 Driving and parking in central Mérida is not fun—the roads are narrow, mostly one-way, and frequently filled with cars as well as pedestrians spilling over from the equally crowded sidewalks. Many hotels will have special deals worked out with specific lots, and it helps to know ahead of time which parking lot is affiliated with your hotel. Otherwise, look for the estacionamento signs (sometimes simply indicated by an E in a red circle), find one near where you will be staying, and just know that you will pay for an hour or so before you can come back and move your car to the appropriate lot. Once you’re settled-in, the city will reward your effort to be there. At least for a day or two. 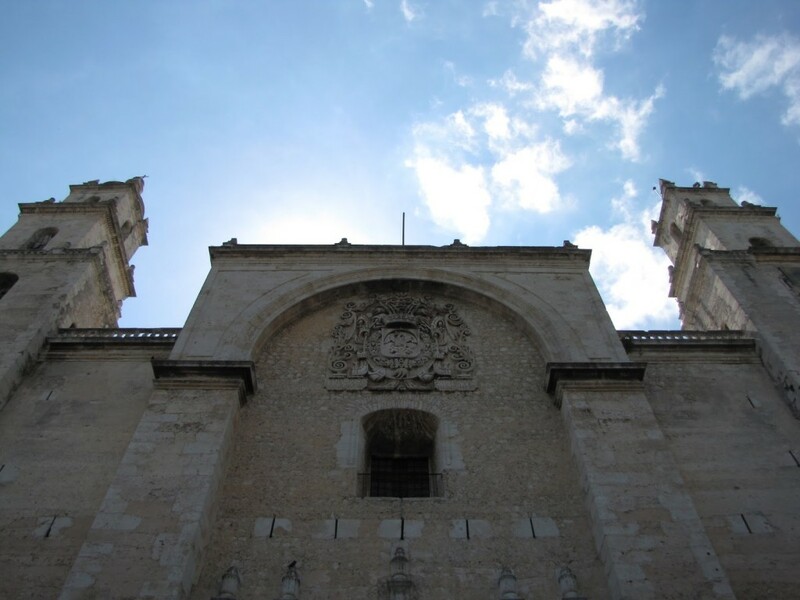 Mérida is home to good shopping, numerous restaurants, a few solid museums, and faded glories of colonial architecture. 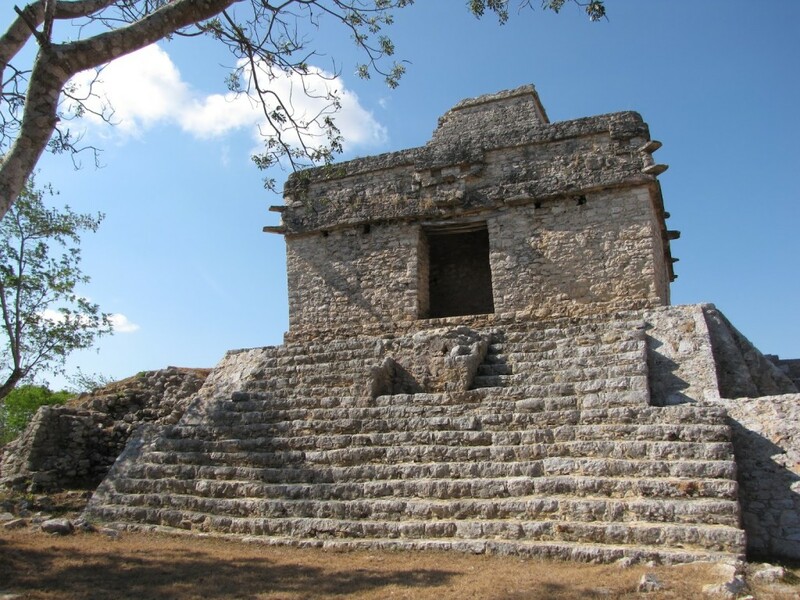 It also lies in proximity to a number of Maya ruins (day trips to the World Heritage sites of Chichén Itzá and Uxmal are available from the city) as well as to the sea. As a result, the city is a popular stop for cruise lines, and during the day many tourists will come ashore to acquire relatively inexpensive, locally made goods, including jewelry, masks, wide-brimmed hats, embroidery, and other textiles. Even Josh and I, who had not planned on shopping at all, ended up contributing a fair amount to the local economy. I should probably note here that Americans and Europeans often feel taken advantage of in Mexico, especially in larger cities like Cancún and Mérida. Sometimes such feelings are the result of misunderstandings born out of overlapping but ultimately very different cultural economics. Sometimes they are the result of one person actually taking advantage of another. As a foreigner, you are certainly a target for vendors and guides who rely on the money of tourists for their own survival. That can get very old very fast, especially as you hear the same lines again and again. For instance, nearly everyone claims that what they sell is “authentic” and that everything sold everywhere else is “fake.” Without being an expert myself on Maya goods, I can only advise that whatever you hear—from angry tourists and hungry vendors alike—take it with a grain of salt. After finally checking-in to the hotel, the friendly guy attending the front desk pointed us towards a nearby collective, where, he claimed, proceeds from sales were redistributed to all of the participating artists in an effort to support the local communities as a whole. True? Nope. That is, not according to the many fuming reviews I have since read on TripAdvisor. But at the time, trusting both our hotel and the seemingly sincere man we met at the store itself, we ended up purchasing a few pieces of opal jewelry (mostly as gifts) for decent prices. Were the stones authentic? I fear the answer to that is also nope, despite the certificates accompanying each piece. One of these days I will screw up my courage and have mine appraised, but in the meantime I’ve decided to just enjoy them both as the pretty trinkets they are and as the gentle reminders of the fallibility of my own judgement they have become. On our second night, we allowed another man to draw us into his store for jipijapas (aka, Panama hats, made from jipijapa palm leaves), hammocks, and clothing woven with sisal. 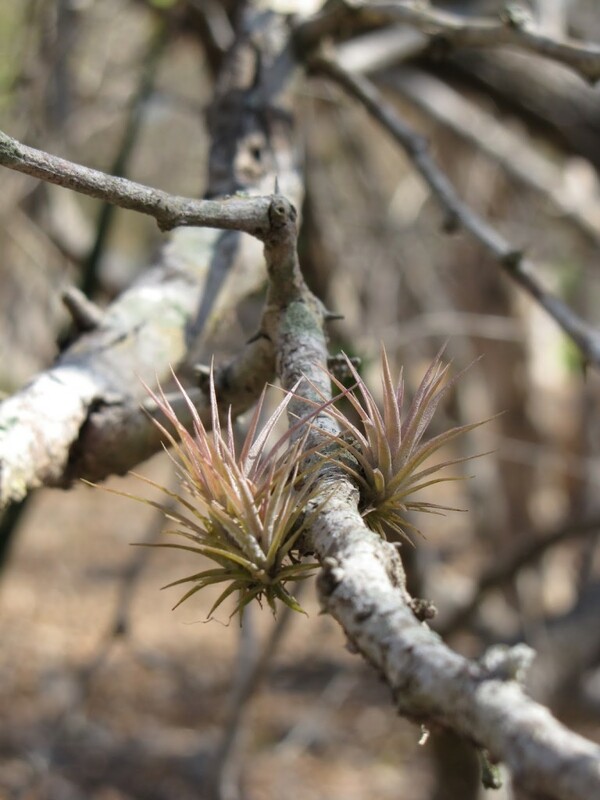 In addition to being light, strong, flexible, and breathable, the fibers of both the palm and sisal are supposed to possess properties of a natural bug repellant—all highly desirable features during a Yucatán spring. Unlike most touristy items, such products are actually popular with locals, and the hats especially were essential wearing for anyone working in the sun. We chatted with the owner for a while, and as we tried on items he showed us pictures of himself and his associate as a child and young man, respectively, working in the caves where jipijapas are made. He explained that manipulating the fibers requires the damp, warm environment of the caves, just as the finest weaving on the top of the hat requires the small hands of children and women. Because of the poor air quality, hat makers can only remain underground for a few hours a day. I think he told us all of this to illustrate the communal nature of his store, to convince us of the specialness of the hats, and to illustrate why they were worth the amount he was asking for them (the equivalent of about $40 each). Outwardly, we tried not to disappoint him with our reactions. Inwardly, the actual effect of his story was somewhat different. Having just spent an hour ourselves in a Yucatán cave, the idea of anyone, especially children, working in such conditions was wrenching. The realization that by purchasing the hats we would be supporting such a system was horrifying. And yet, if we didn’t buy anything, those same people would be that much worse off due to the lack of income from their labor. Intellectually, of course, I know that we all participate in similarly fraught economic situations everyday. But as an American, it is rare to have the system laid so bare before you, to see so clearly how inescapable it is, or to be so close to the people most affected by the terrible dichotomy of life saving/life endangering work. I am still not sure what the right thing to do actually was. In the moment, however, we chose the easier path of the more immediate good, and are now the (conflicted) owners of two very nice jipi hats. Since returning home, I have come across a few reviews by scorned tourists challenging the notion that jipijapas are constructed in caves. I would love for that to be true. 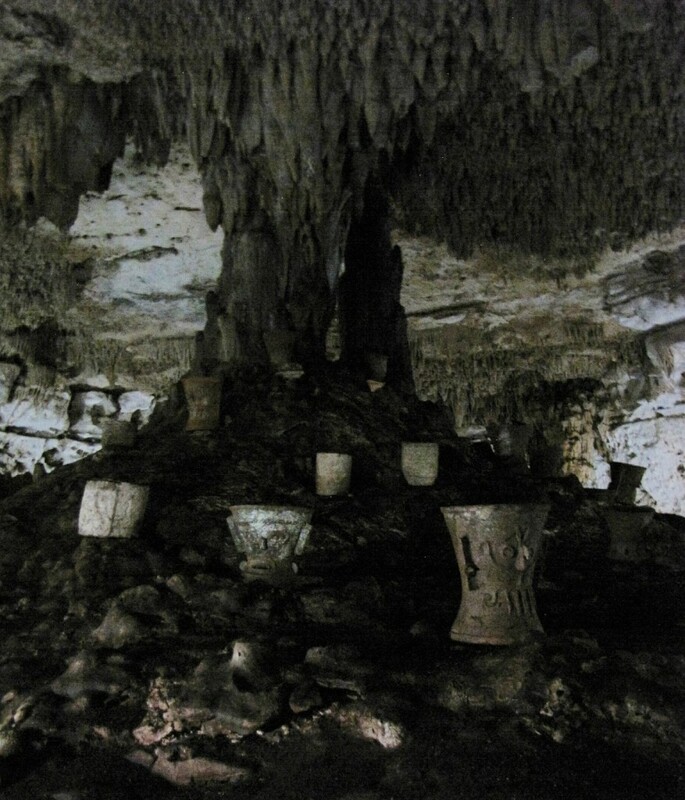 Unfortunately, as documented here, the practice seems to be alive and well, although in Becal such caverns may be man-made and not nearly so deep as the likes of Balankanché. Perhaps that makes all the difference? Or is that idea just another scam, one we try to sell to ourselves to make our own lives a little more comfortable? Incensors around a naturally formed column representing the Ceiba, or World Tree, Balankanché. Photo by Renée DeVoe Mertz, May 20, 2015. Over the course of my various travels, there have been five moments when it occurred to me that I had put myself in a situation where I might die. The first took place in London, during a late night stroll along the bank of the Thames. The second was in Taiwan, sitting at the front of a bus making its way down the winding sliver of a cliffside road inside Taroko Gorge. The third and fourth were both in planes during storms, one while flying through the edge of a typhoon over the Pacific, the other in a much smaller aircraft over the Midwestern United States. And the fifth instance happened this spring, during a tour of Balankanché caves. 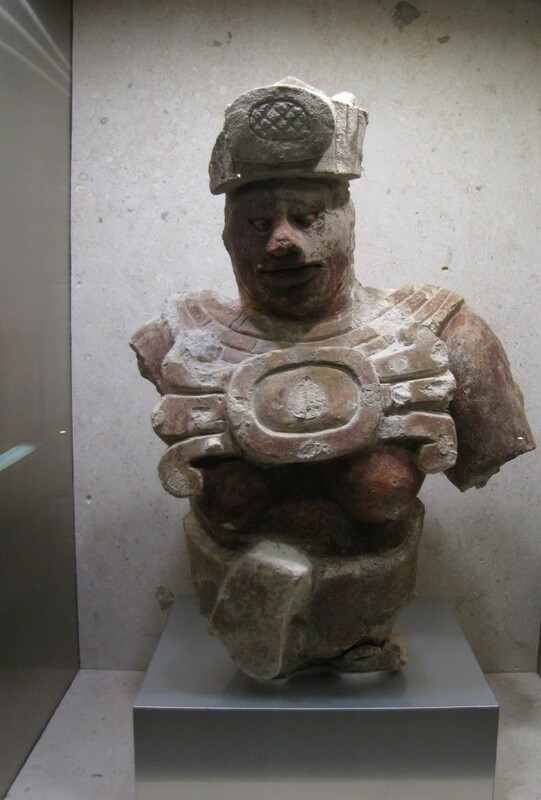 Located about 4.5 km southeast of Chichén Itzá off highway 180, the site of Balankanché had been used, off and on, since at least the Late Preclassic (300 BCE—250 CE) until the fall of Chichén. 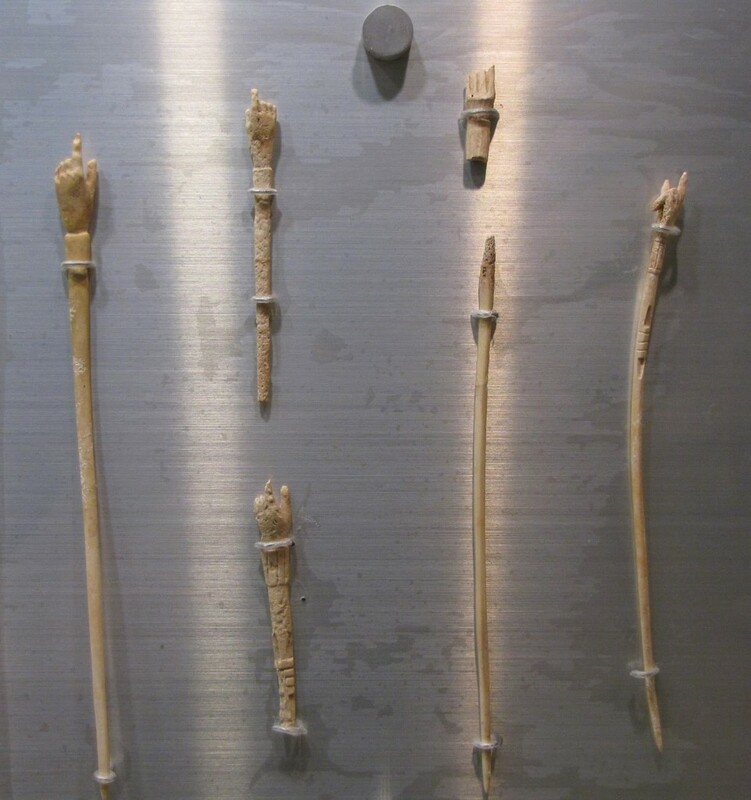 As a sacred site, the many clustered, in situ artifacts consist of implements for rituals. 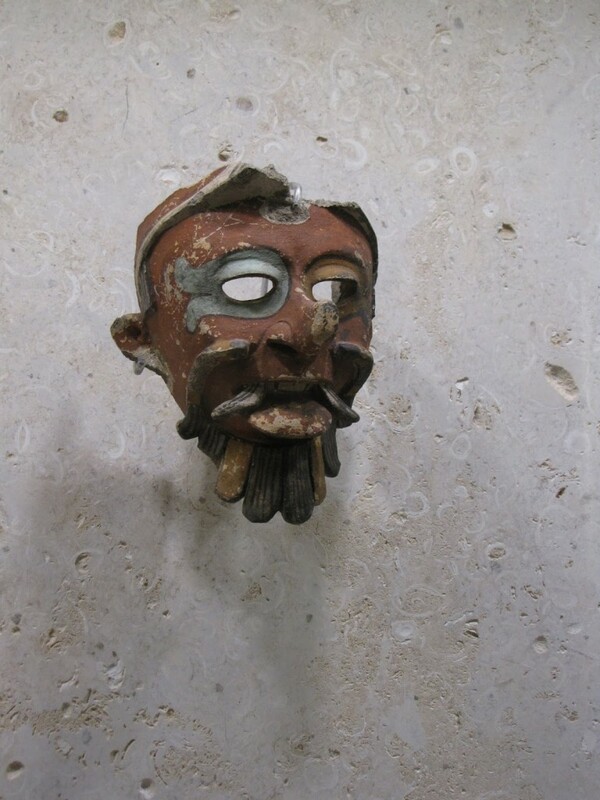 Incense burners—several of which possess semi-abstracted faces—are particularly, and unusually, abundant. The cave itself is essentially T-shaped, with the central passage culminating in a chamber dominated by a naturally forming column and stalactites that together resemble the trunk and hanging branches of a great, subterranean tree. 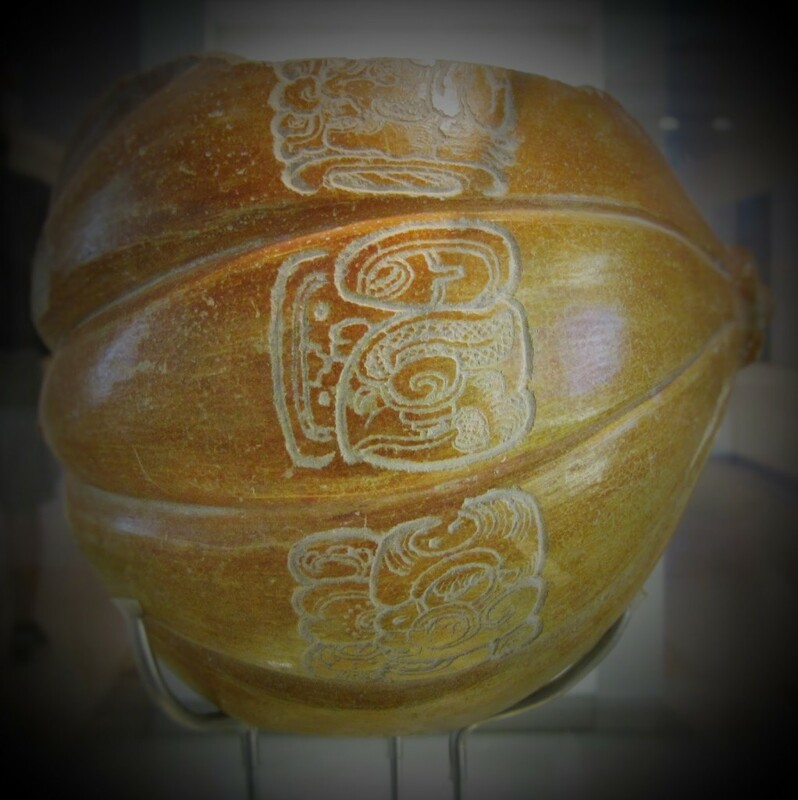 To the Maya, this formation represented the World Tree, or Ceiba, which connected the three layers of the universe: heaven, the middle (terrestrial) world, and the underworld. The raised ground around the bottom of the “tree” is heavily dotted with incensors and may have been used as an altar. Having grown up in an area similarly situated on limestone, and thus similarly punctuated by caves and sinkholes, I was particularly excited by the possibility of visiting this site. However, my experiences with the cool environments of caverns in the US colored my expectations of what the Yucatán counterparts would actually be like. Despite having read that the air would be warm and humid, and that the “major danger” archaeologists faced “during the exploration was lack of oxygen,” my brain somehow never accepted what this had to mean for our own visit until we were actually in the tunnels themselves [Coe 2001, 399]. We arrived at the site after spending the morning and early afternoon in the sun at Chichén Itzá. Fortunately, the air conditioning in the car had already provided some much welcome relief from the heat and helped revive our energy for this next adventure. Upon our approach, though, we learned that we were the only people at the welcome center, and the next tour wasn’t scheduled for another 45 minutes. Waiting was a gamble, as the site’s policy is to only take groups of five or more into the caves; if no one else came, we would have wasted our limited time. Spurred on in my enthusiasm by wishful optimism, I assumed more people would show up closer to the time of an actual tour, and so we opted to wait. And then, when the tour time came and went and still no one else had arrived, we waited a little longer. Finally, after almost an hour and a half, we decided to leave and try to salvage the rest of our afternoon by visiting the nearby Ik Kil cenote. As we got up to leave, the man supervising the site stopped us and offered to let us go if we paid for two extra people. We agreed, albeit a little reluctantly, and he called over one of the guides to take us through. At this point, I was a little annoyed. After all, there were three guys, including our own guide, who had been waiting the whole time we were there to lead people into the caves. Surely, I thought, it was better for them to take two people rather than no one at all. Making us wait and then pay extra felt a lot like getting fleeced. But we had already invested the time, and not going would have been the second major disappointment of the day. So we sucked it up and determined to make the most of the opportunity we had. Our guide was perfectly pleasant, although he spoke very little and led us quickly through rising and falling tunnels. At first I wished he would slow down so we could better take-in the surroundings; 20 minutes later, I wished we could somehow go even faster. His job was not so much to provide information or guidance (the piped-in dramatic voices near the entrance and installed electrical lighting did that) as it was to occasionally draw our attention to the major points of interest within the caves. It was also, I soon understood, to make sure we didn’t somehow get lost or pass-out. There is only one entrance into the caves, which means that there is only one source of fresh air. As we made our way further underground and further from this opening, the atmosphere became steadily hotter and more humid. Eventually, it felt as if we were walking through water, and I found myself unable to get enough oxygen into my lungs. Stopping did not help. The only way to get the O2 I so desperately wanted was simply to keep walking until conditions improved. The effect lessened somewhat—although not enough to breathe comfortably—when we reached the Ceiba, and we paused there (for as few minutes as possible) to take pictures. We then went a little further into one of the branches of the “T,” but my memories of what we saw are hazy at best. I do recall, however, my intense relief when I realized we were heading back and my even greater relief when we stumbled out into the open air. There were several moments, both going and coming, when I had to suppress waves of panic, and I was thankful to have both Josh and our guide there. Knowing that they, too, were having trouble breathing reassured me that the issue was environmental and not personal (ie, I was not having a heart attack) and that if we just kept going we would make it through. Even so, it took several hours after leaving the site for the squeezing sensation in my lungs to go away and for my breathing to return to normal. I’m also embarrassed to say that although we finally appreciated the reasonableness of their five-person minimum policy, in our lightheaded, respiratory desperation and general desire to escape the site, we forgot to tip our guide. This was the worst tipping mistake of our trip, and the one thing I most wish we could go back and change. 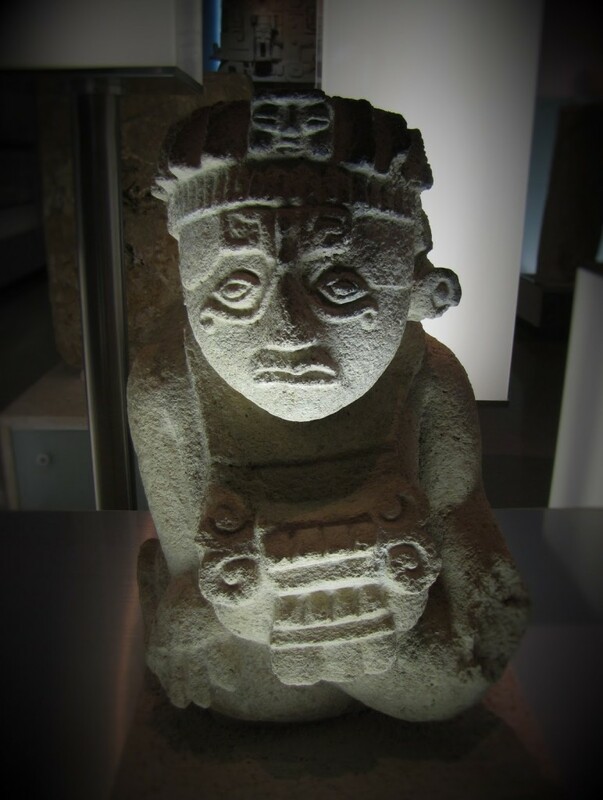 Ultimately, although I am glad we went, I don’t foresee ever returning to Balankanché and would only recommend it to the physically sturdy with a strong interest in Maya culture and archaeology.